Hello from the Land of 10,000 Lakes, Lutefisk and Jessica Lange (award season is upon us – thought I would throw in some homegrown Hollywood royalty)! Several of you have been asking for an update on the trip and I realize I haven’t posted anything for a while. We are still in Minneapolis, The Little Apple, and will be for another week. We just returned from a whirlwind trip to Philadelphia and New York City, The Big Apple, where we caught up with friends (thanks to all of you who broke away from busy schedules to hang out! ), distended our stomachs and punished our livers. Early March brings us to San Francisco, where we will catch up with friends, distend our stomachs and punish our livers, then Hawaii for a few days of recoup before we fly to Australia. It has been surprisingly balmy and relatively snow-less in Minnesota, such a contrast to last year’s record-setting cold temps and snow dumps. But you won’t hear any complaints from me. I don’t miss those days when I had to dash outside to start the car and let the engine run for ten minutes before setting off for school or work (today some cars are equipped with a remote control starter, don’t ya know), ensure that my hair was completely dry so icicles wouldn’t form at the tips (they did sound pretty when I shook my head, though, sort of a xylophone-meets-wind chime timbre), or walk like a penguin to avoid slipping on ice, much of it masquerading as asphalt or concrete. Despite the mild weather I have been spending a lot of time indoors, cooking, catching up on reading and discovering some great blogs (my new favorites are The Art of Doing Stuff and The Heavy Table). I have also been writing, primarily playing catch-up on my blog posts, but also recording my impressions of the European leg of The Grand Tour and remembering our experiences on the road. 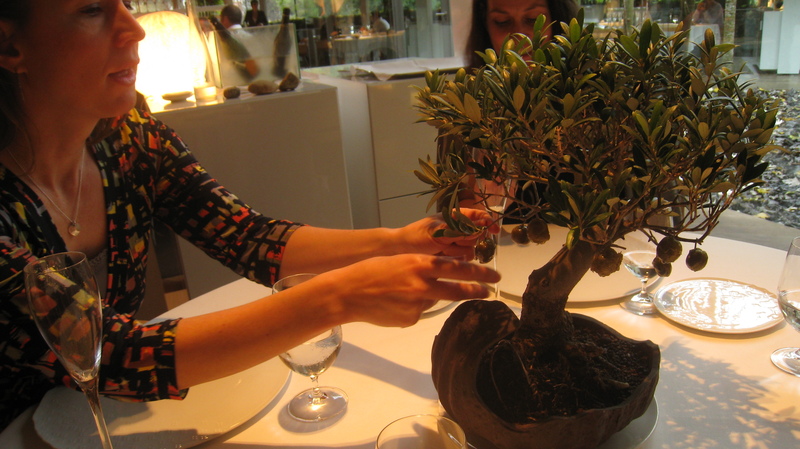 Caramelized olives hanging from a bonsai olive tree, El Celler de Can Roca. A little preview of what’s to come. Among the experiences was our trip to a town outside of Barcelona for a lunch at El Celler de Can Roca with our good friends Sean and Abby. The word “lunch” is inappropriate as this was a feast, an epic one, exquisite to the point that I can safely proclaim it the best meal of my life. There, I said it. The entire day was not without its faults, however, and I have been thinking about what could have made the experience better. So, for my next post, I will put my amateur food critic hat on again to give you my review of Spain’s best restaurant and the world’s second. A little teaser on what’s to come. But only after I rediscover a vegetable to eat. Undo the damage wrought by red velvet pancakes and applewood smoked bacon, porchetta and lemon aioli sandwiches, fried egg and pancetta pizza, spicy bloody marys, smoked Manhattans, gin and tonic cocktails and glasses of Taittinger at 2 AM. Ahh, how I missed you, New York City. 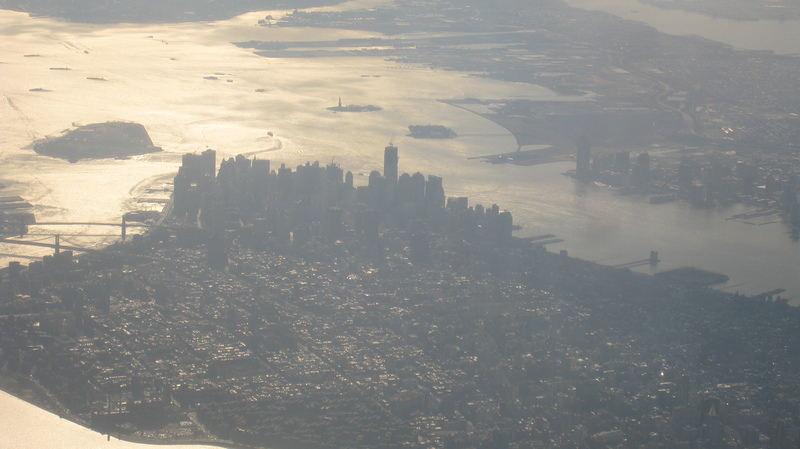 View of New York City and Statue of Liberty from our plane. That is a fabulous photo of NYC! Having flown over many times in the last few months I love the view, and this is definitely a great capture! And, I’m jealous of your gastronomic adventures in Spain! Enjoy the next phases of the trip. I’ll be enjoying vicariously.